I wake up to a kitchen full of dirty dishes because we ran out of room in the dishwasher last night. Drummer was up during the night, so Ryan thoughtfully let me sleep a bit longer and got the school girls off. I decide that maybe I should shower before I tackle dinner and breakfast dishes. I return to the kitchen where Clover has somehow managed to start the dishwasher. Full of clean dishes. Sigh. I can't put away a bunch of wet dishes, so instead of drying them all by hand, I run a "short" cycle while I begin the laundry. Good for me, I think, getting the laundry done early in the day so we're not waiting to switch it instead of going to bed at night. Then I discover some strawberries I left out because there was no room in the fridge. Oh, yeah, forgot about those. Seriously? They can mold that fast? as I pick up the dripping red container, trying not to drip along the trip to the garbage can. I tackle the rest of the kitchen as I wait for the dishwasher to finish drying. I finally get the entire kitchen cleaned plus some random things around the house. It's already time to pick up the girls from school. Maybe I can squeeze in some sewing while they're working on homework. Oh, yeah, the laundry. I have Divine bring in the load from the dryer. What...the....why.....is......there......red........crayon........on............EVERYTHING!?!? Another Sigh. Can the sewing. I spend the next hour spot treating all the crayon, cleaning out the dryer, and learning that a red crayon in the dryer is not the end of the world. One of the most frequently asked questions I get is, How do you do everything? A picture is worth a thousand words. I should have taken a picture of my pink dryer and my speckled clothes, too, but you get the point. Nobody does everything. You should see my Sewing Studio when I'm in the middle of several projects. My "tricks"? ➊ Ryan. He is the most amazingly involved father. While my mom was here she witnessed Ryan coming into the kitchen one Saturday saying, "Let's go through the kids' clothes and start a bucket of Oxy Clean to soak the stained ones." She turned to me and said, "I would have died if Kurt said that! ", and he was plenty involved. I am blessed to have married such a supportive man. ➌ Passion. Sewing is what I love, so I make time for it. I am constantly thinking about projects I want to do, so the planning is usually mostly finished before I sit down to start a project. I also have kids who enjoy being home. I know a lot of kids (and adults) who can't stand to be home all the time. I enjoy it. The weekends I rarely do any sewing because we're out and about as a family or doing something together on Saturday and attend church on Sunday. There are plenty of days I feel like I get absolutely nothing done, and I snap at everyone, but the great thing is we all get to start with a blank slate the next day. Unless it's covered with dirty dishes, that is. Thanks for this post :). I should be cleaning but I'm wiped out from my morning jog! Maybe I'll be more motivated now, because it really does feel so much better to have a clean house! I constantly think of you when I'm overwhelmed. "If Katy can keep it together with 6 kids I should be doing a lot better with just one!" Love it. I have four kids 9 and under and a huge passion for sewing (and knitting). I do house work REALLY FAST! and take the opportunity to do things like clean the loo when watching kids in the bath. I can't walk up the stairs without an armful of stuff. I plan our meals for the week so I don't have to think about it again and take every and any opportunity to sew or knit. Knitting is great because I can pick it up and put it down real quick. In my house everything has a home and the kids (usually) know where it should go...when motivated by the promise of a tv show or something... My husband is also a treasure. I get the washing clean. He does the rest. This is not to say I live in a pristine house and churn out masses of stuff. This is REAL life. Unpredictable, messy but mostly fun. every day is new - that's what i believe, too. i love that about night - the chance to start over! This is probably my favourite post ever, and necessary - especially this week. I've been in such a slump - I feel like I am running non stop to get my house in order, cleaned out, cleaned, etc. and...I need so badly to spend some time at my sewing table (hellooooo emotional sanity, not to mention pants that fit my son) and yet I can't seem to make it work this week. I really appreciate your thoughts here Katy - hope you get some sewing time in soon! awesome post! some days you've got it, some days you don't. this is so real. This is one of the reasons I love your blog. Your transparency rivals your incredible creative talent. Thank you for sharing both. Love your post and your honesty. It really does help if you have a great supportive man to back you up. Love you guys!! I love this post. I have been thinking about this same subject a lot lately, and formulated a post about it about a week ago...although it's not yet what I want to say...so it will have to wait so I can mull it over a bit more. Thank you for being real and sharing it with us. I think we each have places in our life where we struggle and its important to share with one another. I have learned over the years Id rather have company and friends over in a cluttered unkept house than not at all. Im also learning to ask for help more and say no- now that my oldest 3 children are grown its so so different. the most interesting thing to me is how it suddenly gets so messy again.. right after i just cleaned it up. how does it do that?? i would die if my husband said that, too. i am happy when he just puts his clothes in the dirty laundry basket instead of dropping them on the floor (literally 4 feet away). 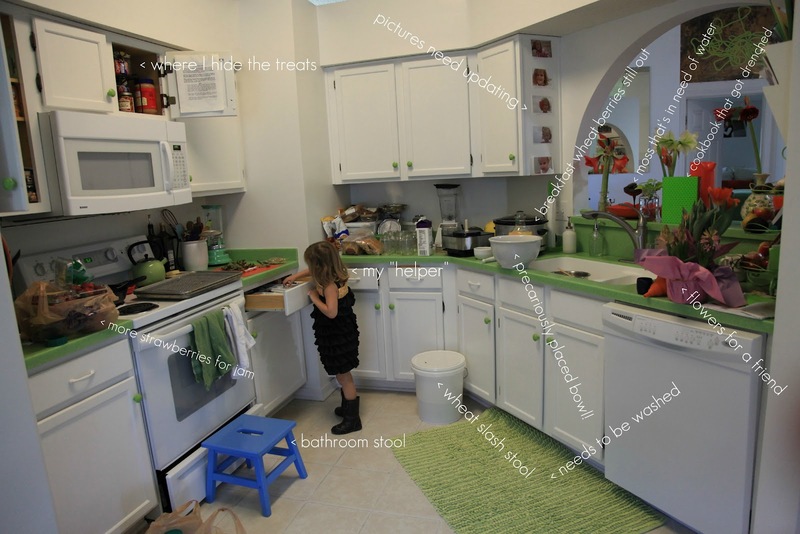 love your green kitchen. as always. Change the name to "Jeremy" and I could have written this post. That was a great post. Thanks for sharing that today. Fabulous! I had a mother say to me the other day "Are those the dinner dishes still on your counter?" Why, yes they are! Funny how we think everyone else gets it ALL done all of the time. Oh, she was very happy to know that my house isn't always clean. I was happy to make her day better. As much as I adore and anticipate a creation of yours on the blog...I really appreciated and felt more connected to you (and all MOM'S!) with this one. AMEN! Thank you for keeping it real and showing pictures of your kitchen! I finally got back to creating this week and remembered how important it is to my sanity. Awesome post. Thank you! I love beautiful pictures, but I love pictures of real life too. It's nice to know that my favorite bloggers have the same dirty dishes waiting to get done. ;) I'm on spring break this week, and I'm hoping to get a project done. I've been sewing with my students for the past five weeks and I'm ready to dive into a project of my own! Nice before and after! Some days I amaze myself and other days I chase my tail. Wish I could sew like you though!! But it is all worth it in the end!!! Thanks for doing this. Sometimes the blogging world makes it seem like everyone else's life is perfect. It's good to have those reminders that we all have our dirty laundry, so to speak. and yes, having a supportive partner makes all the difference. That's such an interesting post, about how you get things done! I don't have six kids (not even one yet :-D) but we still struggle to keep our flat tidy AND have time for nicer things. Can you explain about the wheat berries (and especially the slosh stool). Do you make the wheat berries like oatmeal? Thanks! I hide the chocolate up high. Then I eat it with the pantry doors open so no one can see me and ask for some! Great post! When people ask me where I find time to do all the crafty stuff I do, I just think...if they could only see my house on a daily basis...they would see all the stuff that slides by because I'm busy sewing. love. echoes of my life....thanks for this post. Love you, Katy. I have always loved the realist in you. Thanks for sharing! Thank you, thank you, thank you, for this post! I have been pondering the question "how do I feel so overwhelmed when I have more help than I ever had before?" You've helped me realize that a) some days are like that. & b) some hours are like that! Even if the kids were out w/ the babysitter until 5pm, by 6, the swirling chaos of dinner & homework still descends & we have to get through it & breathe. What a wonderful woman. Put me to shame with my first beast and it's SO good to know I am not the only one who just doesn't get anything done but house and baby.. that is when baby doesn't take over! Wax in the dryer? GAH! Katy, thanks for the info! I read the caption wrong. I thought it said slosh - stash makes much more sense. Have you tried farro? thanks for being real...i will be back! I ran series of interviews called 'the creative Mama series' last year and will do it again this winter...mama's getting real about how they juggle creative life and kidlets/home etc. It was super popular and i learnt that i am not alone at letting the housework sliiiiide. Phew! My favorite is the bathrooms tool perfectly placed under the opened treat cupboard. This is all too familiar. Thanks for keeping it real! I agree with you my passion for sewing is what makes me put everything else aside and forget laundry, ironing and the rest...until it's really time to do it! You are still an inspiration to us all-just a little bit more human now! I LOVE your green kitchen countertop. Where did you get it? Thanks for posting this - I have 5, 18mo to 13yrs who I home school. There are days where it really appears that everyone else really DOES have it all together. And I'm the only one who didn't get a copy of "The Instruction Manual". Most of the time, I know that's not true - but it is nice to have someone prove that things slide at their house too. I love your blog. I see your sewing and am amazed at what you come up with. You have inspired me to be a little more creative in my sewing. Everything you make for your kids is eye candy to me. Some days I let things slide so that I can have time sewing. How wonderful to have such a supportive husband! I have one of those, too . . .makes such a big difference! A quick tip for berries. Soak them in a solution of vinegar and water. 1part vinegar, 10 parts water. Drain, then stick them in whatever container you want (I put them in a colander). They'll last for a good, long time this way! Thanks for this post. Everytime I want to ignore my household responsobilities, I remember this post! Oh my goodness, I recently had this same experience... and I freaked! I just posted on my blog about the great product I found that took all the crayon out. It's called LA's Totally Awesome, and I will always have some in my house now, especially with little kids!